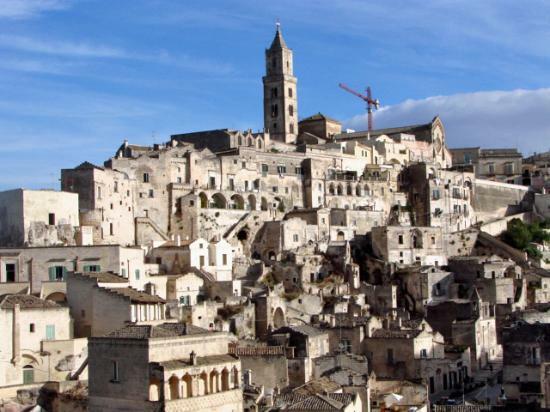 Matera counts about 55.000 inhabitants, is located 400 metres above sea level and is 45 km from the seaside. Much appreciated and renowned for its Sassi districts, the town also boasts other charming and beautiful buildings. You can visit the Dome, built in the 13th century, in Romanesque style, standing impressive on the Civita hill. The Civita dates back to medieval times and is to be considered as the first human settlement in the city as you can see from the walls and fortifications it is surrounded by. Inside the Cathedral, completely restored during the Baroque epoque, you can find interesting wooden sculptures and paintings by local artists. A must is the XVI century stone-made presepe by Altobello Persio and the XV century wooden choir by Giovanni Tantino di Ariano Irpino. Other Romanesque Churches are also noteworthy in the centre : San Giovanni Battista and San Domenico. The baroque area includes the most important churches in this style: San Francesco d’Assisi, Purgatorio and Santa Chiara. Next to the small church of Madonna del Carmine, the Palazzo Lanfranchi, also in baroque style, is home to important art exhibitions. Ex-seminary, it became a secondary school where the famous poet Giovanni Pascoli taught for a couple of years. Recently renovated, Palazzo Lanfranchi is now home to the Museum of Medieval and Modern Art of Basilicata, with an interesting collection of paintings by Carlo Levi, various works from the school of Naples and other local wooden works and paintings. Here, international exhibitions take place periodically. A greater understanding of the origins of the city of Matera can be gleaned by visiting the Domenico Ridola National Museum. The museum was established in 1911 and bears the name of one of the most distinguished citizens of the city. Domenico Ridola was a physician and a Senator with a passion for antiquity. Towards the end of the 19th century, he conducted a number of excavations which brought to light some of the most important Paleolithic and Neolithic settlements in the area. On the basis of his findings, he put together a fascinating collection of archeological artifacts, which has since been enriched and updated thanks to the work carried out by the Museum’s technical experts. Collections of artifacts of the Magna Grecia settlements which flourished along the Ionian coast are also noteworthy. The historic centre is also characterized by various aristocratic buildings such as the XV century palazzo Firrao-Giudicepietro or the Palazzo del Sedile of 1799, which is now the seat of the Conservatory. Also, the XVI century Tramontano Castle, built outside of the city’s walls as per Count Giancarlo Tramontano’s will but never completed because of his untimely death, is of great interest. The Sassi surround the Civita and constitute a city unto itself, completely carved out of the face of the calcareous rock -what is known as tufa stone. The Sassi district is a system made of dwellings carved out of the steep slopes of a deep valley with surprising and unusual features called the ‘Gravina’. The Sassi were once the very heart of peasant life and culture. Nowadays the district has been renovated and has regained new dignity and new life, offering breathtaking views, particularly at night when the glow of the small lights of homes, the craft shops and restaurants turn the Sassi into a living nativity scene. UNESCO declared the Sassi to be a World Heritage Site in 1993. It beckons to visitors, a magnificent, unique view steeped in the past.